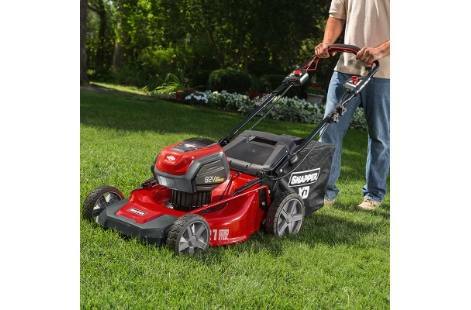 Snapper® XD 82V Max* Cordless Push Mowers powered by a 2Ah, 4Ah or 5Ah Briggs & Stratton® Lithium-Ion Battery are built for durability. Choose from a 19" push, a 21" push or a 21" self-propelled model with a steel 3-in-1 mowing deck, providing mulch, side discharge or bagging options. Get the job done quickly by being able to mow up to 45-minutes** with a 2 Ah battery (additional run time available with separate 4Ah or 5Ah battery). These quiet walk behind mowers are easy to use with a single lever height-of-cut adjustment allowing you to choose from 7 different cutting heights. Vertical storage capabilities saves space in your garage or shed. Plus, easy push button starting and requires less maintenance. Brushless Motor Technology: A long life, 1,000 or 1,200-watt high-efficiency brushless motor provides the power and reliability you need to mow your yard for years to come. 3-in-1: The 19" or 21" steel mowing decks are ready to mulch, bag or side discharge - whichever you prefer. If desired, you can conveniently bag grass clippings with the included large 1.6-bushel (2.1-cubic foot) grass bagger. 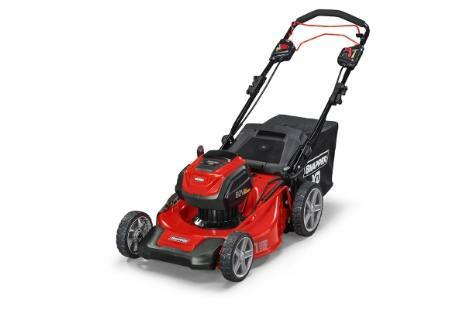 Powered by Briggs & Stratton: A powerful Briggs & Stratton 82V Max* 2Ah or 4Ah Lithium-Ion Battery provides consistent power. A simple press of the durable metal battery-release button allows you to easily take the battery out to charge or use in another Snapper® XD 82V Max* Product. Easy Storage: Compact vertical storage capability allows you to store your mower in tight spaces in your garage or shed. All About Ergonomics: Overmolded rubber handle provides an ergonomic grip and comfort for the operator with the capability to fold up for space-saving storage. It also includes easy-to-reach touchpoints, including push button start. Self-Propelled: The 21" self-propelled model provides smooth operation, allowing you to control the forward mowing speed with the easily accessible speed control lever. Smart and Efficient: Load Sensing Technology allows for the power to adjust to meet the demands of the cutting blades, while single-lever, 7 height-of-cut adjustment easily adjusts to select your preferred cutting height. * Maximum initial battery voltage (measured without a workload) is 82-volts. Nominal voltage is 72. ** Run time and output capacity may be affected by conditions. ^ Suggested prices will vary by market. Prices are shown in U.S. and Canadian dollars. Set-up, delivery, documentation and destination fees not included. See dealer for details. Features vary by model. We reserve the right to change specifications, features and pricing without notice. † See operator's manual or dealer for complete warranty details. Commercial warranty valid on product only, battery warranty valid for residential consumer use only. Features may vary by model. We reserve the right to change specifications, features and pricing without notice.